T-R PHOTO BY THORN COMPTON - Marshalltown senior Giorgio DiIorio (33) stiff-arms Ottumwa defensive back Isaiah Carter on his way to scoring a touchdown in the first quarter against the Bulldogs in the Bobcats’ 36-6, home-opening win. DiIorio ran for 175 yards and two scores in the victory. 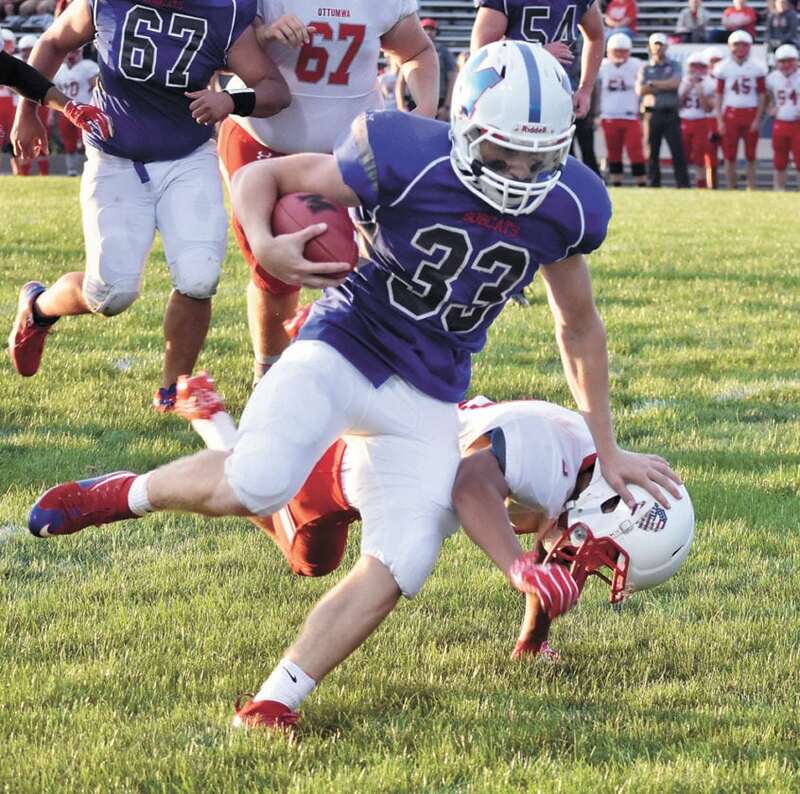 Last season running back Giorgio DiIorio led all Marshalltown backs with 160 total yards rushing in nine games. 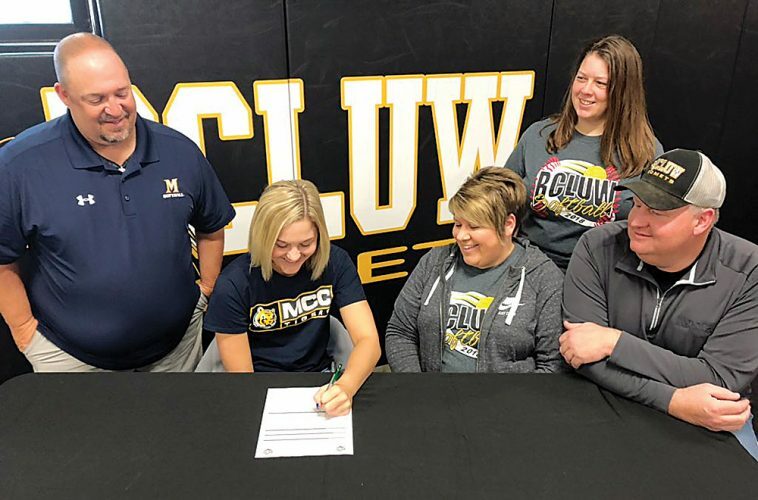 He surpassed that number in a single game on Friday, as DiIorio and the rest of the Bobcats marched up and down the field on Ottumwa on the way to a 36-6 victory, the first for MHS at Leonard Cole Field since Oct. 7, 2016. 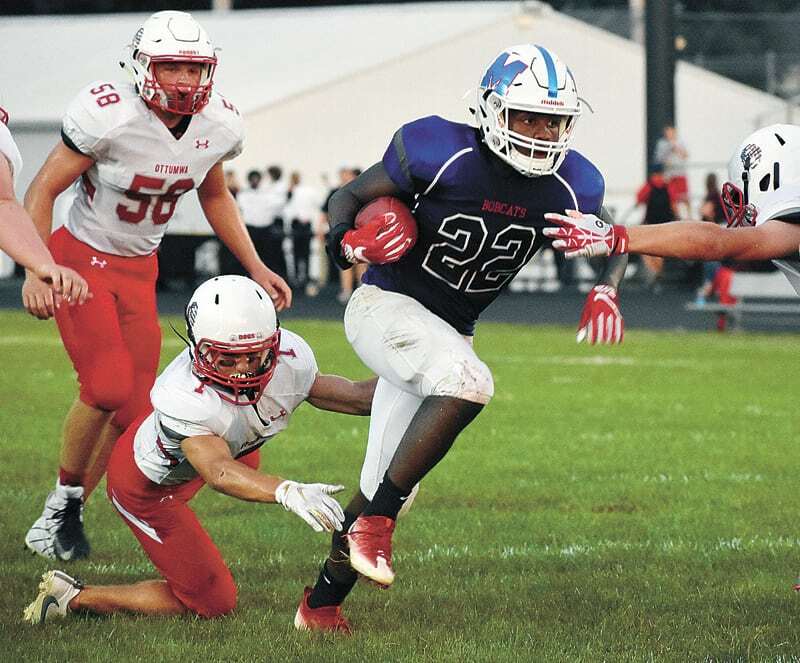 Marshalltown head coach Adam Goodvin, who earned his first home win in his tenure with the Bobcats, said DiIorio’s 175 yards and two touchdowns on the ground were incredible. The offensive line wasn’t just good on Friday night, it’s been great in each of the first two games of the year for MHS (2-0), leading to back-to-back 300-plus yard rushing games. T-R PHOTO BY THORN COMPTON - Marshalltown senior Bennett O’Hare, left, takes contact from Ottumwa defensive back Isaiah Carter on a reception in the second quarter during the Bobcats’ 36-6 win over the Bulldogs on Friday at Leonard Cole Field. DiIorio was the hot hand but Derrick Garth had a great follow-up to his three-touchdown debut for against Des Moines North last week. Garth finished with 88 yards rushing and a score, and he added a 29-yard reception for a touchdown as well for his fifth total time in the end zone this season. Bobcat quarterback Jacob Smith, who got his first passing touchdown of the year on the Garth scamper, said he could feel the score coming as soon as the ball was released. “He made one cut and he was in, I was so hyped after that play,” Smith, who finished 7-for-9 for 120 yards and that touchdown, said. 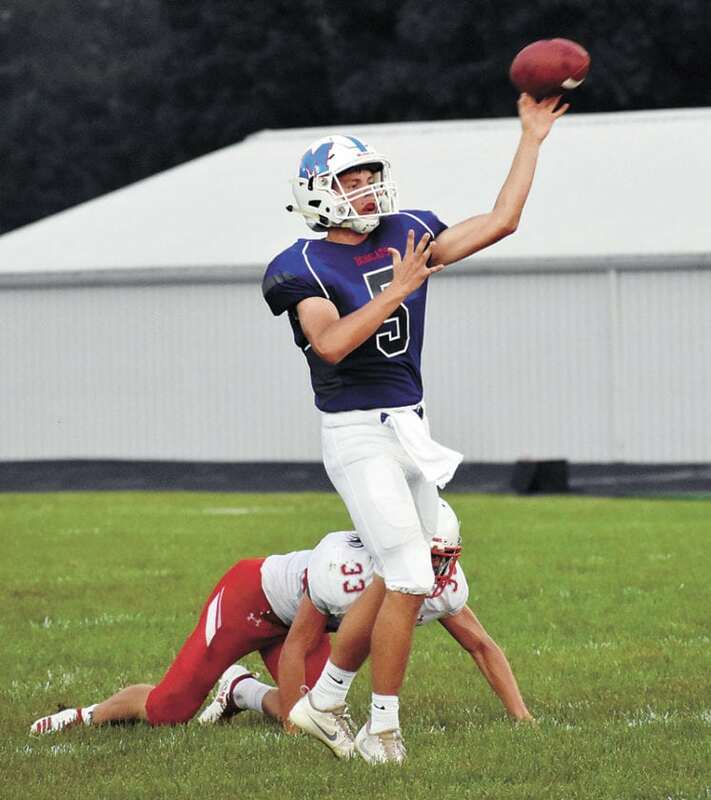 Goodvin said his quarterback had a great bounceback performance after a 3-for-12 debut under center in the win over the Polar Bears last week. T-R PHOTO BY THORN COMPTON - Marshalltown junior Carson Beals (40) vaults over a tackle attempt from Ottumwa defender Isaiah Carter during the Bobcats’ 36-6 win over the Bulldogs on Friday at Leonard Cole Field. Everything the Bobcats have been able to do hinges on the offensive line, and center Kyle Griego said he and the rest of the big guys up front take pride in their aggressive play. As an offensive lineman, seeing your running backs continue to rip off huge gains on wide open holes is a point of pride, one that Griego said he enjoys immensely. “We want to pass too, but when we run the ball we want to take it to the house,” he said. Goodvin said the offensive line was at a disadvantage throughout the night because of the size that Ottumwa (1-1) was bringing, but they didn’t let a little size discrepancy keep them from controlling the trenches. The Bobcats were in control essentially from the opening kick, but there was a turning point at the beginning of the game that could have shifted momentum. 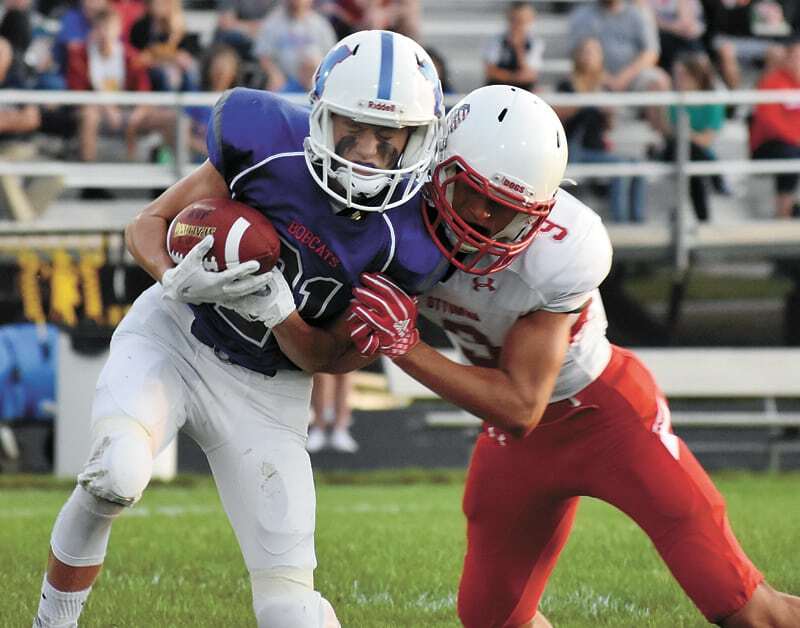 After three-straight Garth runs to start the game, Marshalltown faced a fourth-and-one from inside its own territory and elected to go for it. Garth would plunge ahead once more for a four-yard pickup and a first down, then on the ensuing play DiIorio ripped off his longest run of the game, a 50-yard sprint that set up a two-yard touchdown run by Carson Beals. 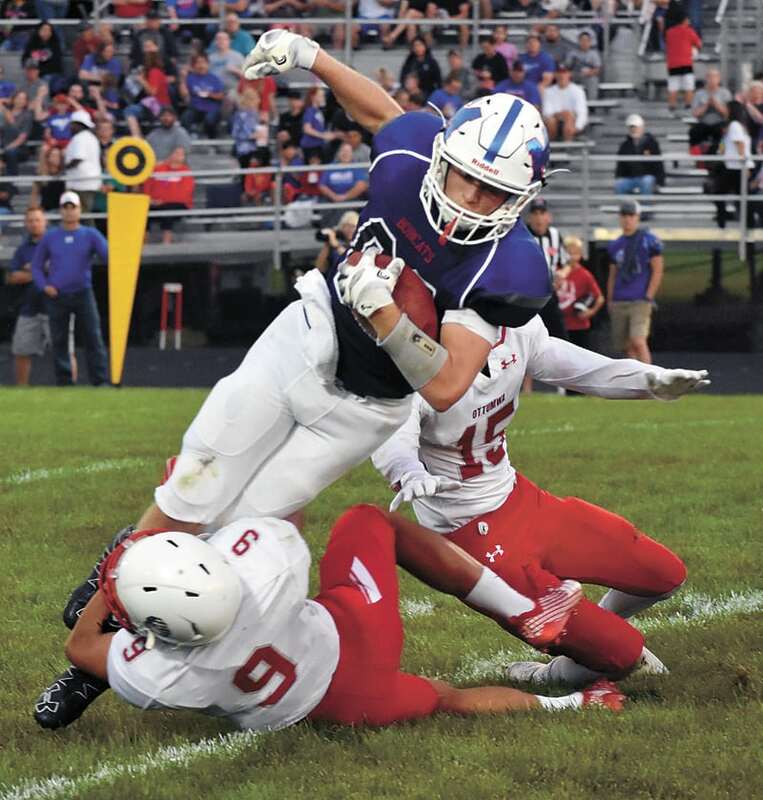 While the offense was clicking to the tune of 432 total yards, the defense was once again stifling, holding Ottumwa to just 229 total yards and one score on its first drive of the game. Even after that first Bulldog score made it 8-6, DiIorio went 52 yards on back-to-back runs for the second Bobcat touchdown of the game, swinging the momentum to the MHS side for the rest of the contest. All night, Ottumwa kept trying to stretch runs to the outside for a lane, but while the Marshalltown front seven shut down the inside, the defensive backs flew around and limited any gains from the outside, particularly safety Justice Richardson. Not only was this Goodvin’s first home win in his first two years as the Bobcats head coach, but he also beat his alma mater in Ottumwa and his father, Brian Goodvin, as defensive coordinator. He said it was nice to get the win over his dad, but he also looks forward to things going back to normal around the Goodvin household. “I am sure we will talk a lot the next few days. I’ll let him contact me first,” Adam said with a large grin. 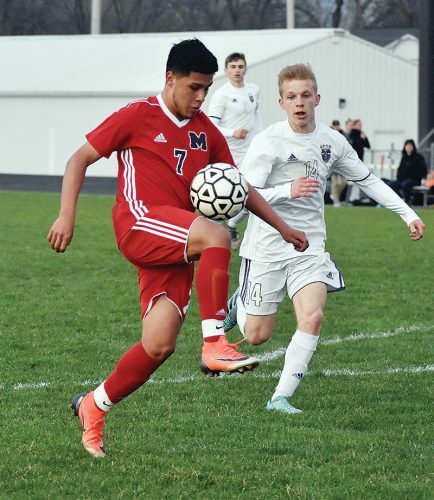 Now that Marshalltown has two-straight wins to start the season, the Bobcats want to make it three straight for the first time since 2012. Standing in their way next week will be Mason City, the only team MHS beat last year. MHS — Carson Beals 2 run (Dylan Eygabroad pass to Bennett O’Hare), 7:52. 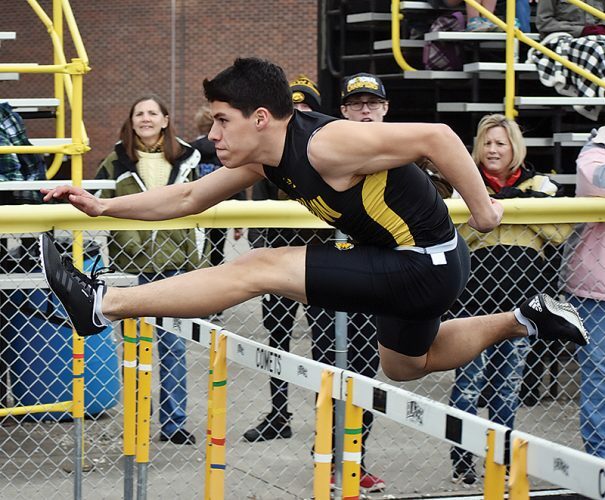 OTT — Gage Cole 2 run (run failed), 1:52. MHS — Giorgio DiIorio 29 run (Kabba Pins kick), 1:11. MHS — Derrick Garth 4 run (Pins kick), :45. MHS — Garth 29 pass from Jacob Smith (Pins kick), 4:06. MHS — DiIorio 5 run (Pins kick), 1:27. RUSHING — OTT: Eli McDanel 7-89, Gage Cole 18-62, Colton McKinnon 6-10, Caleb Vasconez 1-8, Andrew Cole 1-3, Blake Klein 1-0, Caleb Barndt 2-(minus-3); MHS: DiIorio 13-175, Garth 13-88, Beals 12-52, Patrick Landeros 1-0, Pins 3-(minus-2), Jonathan Hernandez 2-(minus-3). PASSING — OTT: McDanel 7-12-60-; MHS: Smith 7-9-120-0. RECEIVING — OTT: Vasconez 4-41, Barndt 2-10, Ryan Simmer 1-9; MHS: Garth 1-29, Eygabroad 2-28, O’Hare 1-23, Will Van Buren 1-17, Beals 1-15, Pins 1-8. 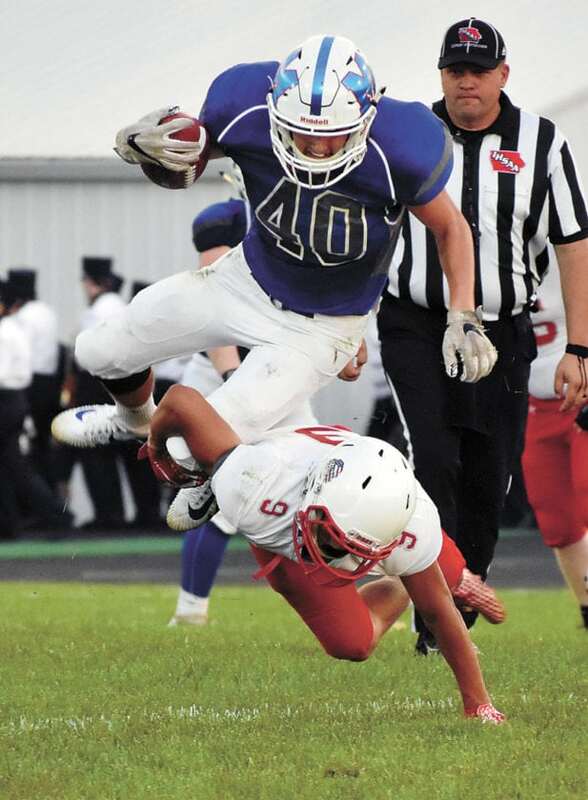 T-R PHOTO BY THORN COMPTON – Marshalltown junior Carson Beals (40) vaults over a tackle attempt from Ottumwa defender Isaiah Carter during the Bobcats’ 36-6 win over the Bulldogs on Friday at Leonard Cole Field. T-R PHOTO BY THORN COMPTON – Marshalltown senior Giorgio DiIorio (33) stiff-arms Ottumwa defensive back Isaiah Carter on his way to scoring a touchdown in the first quarter against the Bulldogs in the Bobcats’ 36-6, home-opening win. DiIorio ran for 175 yards and two scores in the victory. T-R PHOTO BY THORN COMPTON – Marshalltown senior Bennett O’Hare, left, takes contact from Ottumwa defensive back Isaiah Carter on a reception in the second quarter during the Bobcats’ 36-6 win over the Bulldogs on Friday at Leonard Cole Field.